As part of the launch of the IslandNewspapers.ca project today, we arranged to have Transcontinental Printing in Borden – the branch of TC that prints The Guardian and the Journal-Pioneer – produce a facsimile of the February 11, 1914 newspaper, printed first 100 years ago today. The process turned out to be rather simple: I grabbed high-resolution TIFF files from the IslandNewspapers.ca page for this date, uploaded them to Dropbox where the composing room in Borden could grab them, they sent along a proof press to the Guardian office in Charlottetown the next day, we agreed on a price and 500 copies showed up in Charlottetown this morning. Magic. 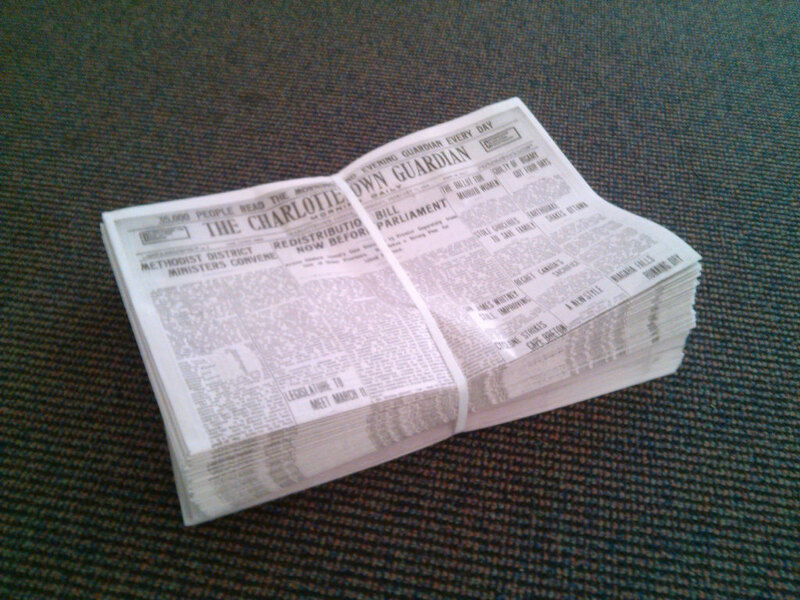 I’m very, very happy with the result: they were able to recreate the historical wide-broadsheet size of the 1914 paper, and while the source material – scans of microfilm of originals – wasn’t perfect, the paper is eminently readable and, for most intents and purposes, just like reading The Guardian 100 years ago. Knowing we’d have more than enough copies to meet the demand at our launch event, I spent the late morning walking all over downtown Charlottetown delivering copies: the Coles Building, City Hall, coffee shops, the public library. My favourite stop was Hyndman & Company on Queen Street, my own car insurance broker and a company that was already established – and a regular Guardian advertiser – by 1914. 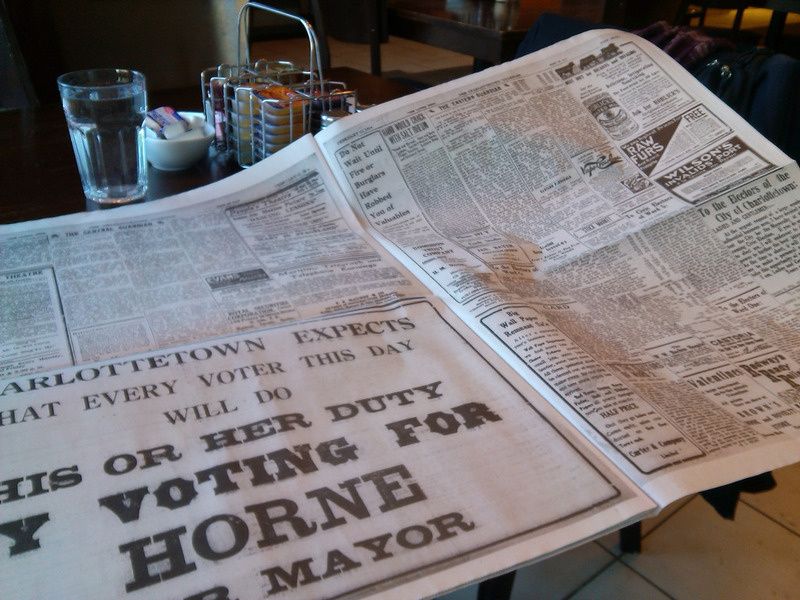 When I was done making my rounds, I sat down for an early lunch at Casa Mia Café and enjoyed the experience of reading the paper, 100 years on, as if it was today. 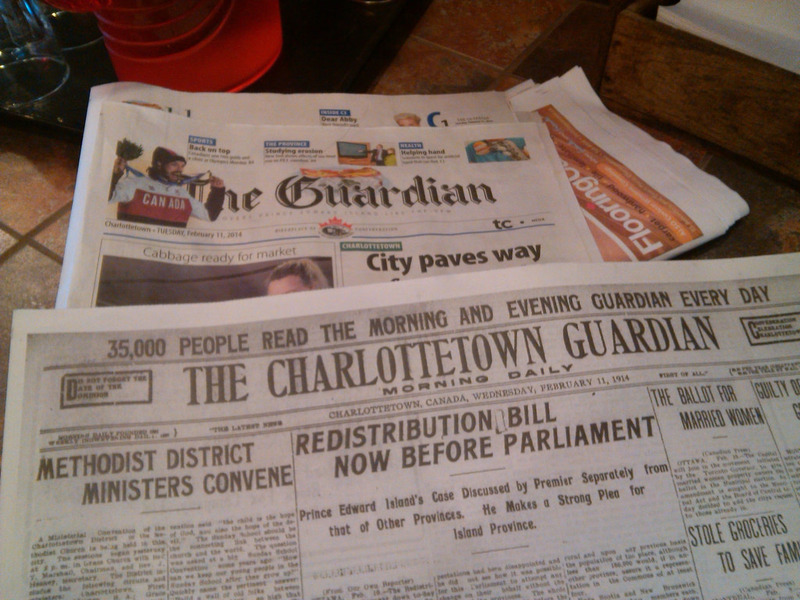 You can pick up a copy of the 1914 Guardian at the The Guild box office, at Confederation Centre Public Library or at ROW142 coffee on Richmond Street while supplies last. Written February 11, 2014 at 4:56 p.m. I am looking for information on a historic property in Summerside. It is still referred by some as The Calhoun House on 39 Eustane St. Built in 1871 or 1872. Ran as a single family dwelling until the late 1940's then into apartments. I know it was featured in The Guardian in 1913 for sale. I have no idea what day. 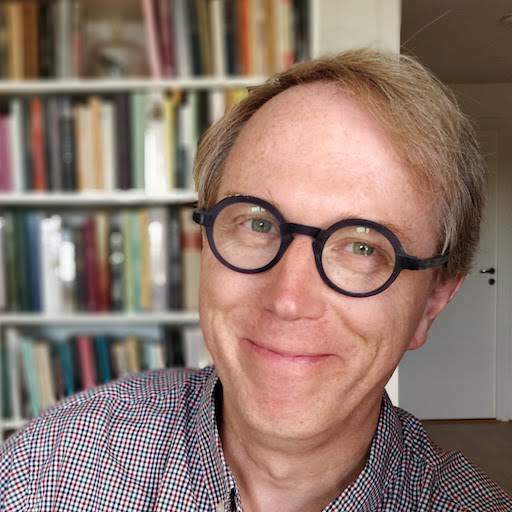 I am trying to find out if a picture was featured with it or if one even exists as it stood in 1871-1935. I would like to see what the property looked like at that time.It still stands. A wonderful piece of history.